TYWKIWDBI ("Tai-Wiki-Widbee"): Where to live in this alternate world? I may have posted this before, but I'm too busy to look for it, and I love maps, so I'll risk the repost. The map has been generated by reversing land and water and elevations. The ocean trenches become mountain chains. The verdant/desert attributions are presumably extrapolated from current terrestrial patterns. 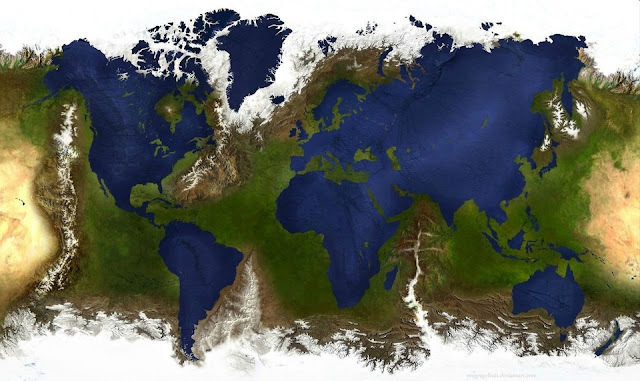 So... where would I want to live in this reversed world? That Mediterranean Peninsula would probably get hammered by wicked tropical weather. I think maybe near the shores of Lake Madagascar, with the mountains on one side and the African Sea on the other. Addendum: Oops - this is a repost from six years ago. so the deepest place is the former mount everest? I'd like to try one of the African or Eurasian islands. However I wouldn't want to try scaling Mount Mariana. Something I read some time ago that's stuck with me is that if you cut Everest off at its base and dropped it into the Mariana Trench its peak would be a mile underwater.